"...Kathryn Walsh’s extraordinary production of Kate DiCamillo’s is equally funny and heartbreaking. It’s a perfect story for Easter as well as for the first weeks of Spring. This talented director guides her skilled actors in creating a cast of characters that sparkle with candor and imagination. If youngsters attending this play haven’t already read the book upon which it’s based, this production will absolutely inspire them to do so. 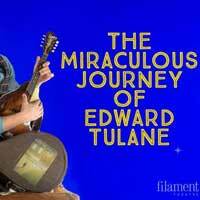 Filament Theatre Company has brought so many wonderful literary adaptations to life for Chicago audiences, but it can add this classic to the roster of their very best. It may be that this is Filament Theatre’s greatest achievement ever for family audiences, and it will certainly be remembered for a long time to come."